MANILA—The University of the Philippines Fighting Maroons surprised pundits by barging into the UAAP men's basketball finals just four years after finishing the annual tournament with just one win—and now one of the rising young sports journalists in the county is going to explain how UP's alumni engineered this amazing turnaround. To be penned by columnist Naveen Ganglani, who has extensively covered the Fighting Maroons and the UAAP since 2009, the new book will provide readers with an in-depth look into the events leading to the humble beginnings of Nowhere to go but UP (NTGBU), a group of UP alumni volunteers who dared to believe that they could reinvigorate UP's resource-challenged sports programs. "I’m incredibly lucky and grateful to the members of Nowhere to go but UP group, who have given me the opportunity to tell this amazing story," said Ganglani. The writer, an alumnus of De La Salle University who roots for his alma mater’s Green Archers, nonetheless acknowledges that "the rise of the Fighting Maroons in the past five years leading up to their trip to the UAAP Finals is nothing short of phenomenal." "As an outsider looking in, I hope to convey how the story of a rival school is incredibly inspiring, even to those who do not bleed maroon. I hope to do justice to their story by writing an accurate, comprehensive, well-researched book that will answer many questions about the rise of the Maroons," added Ganglani. 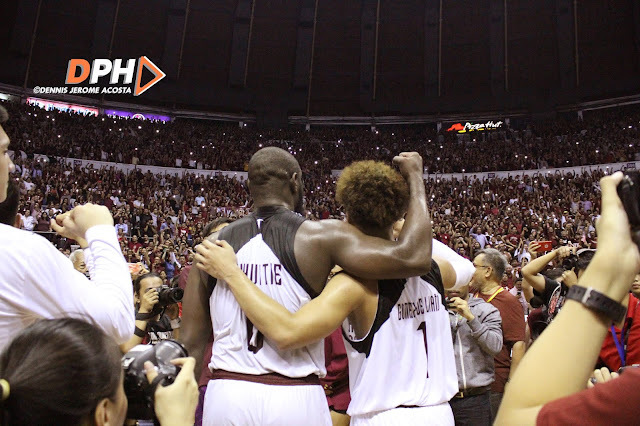 "What were the early challenges the group faced as UP tried to rehabilitate its reputation as one of the UAAP’s cellar-dwellers? What was the motivation behind the bonfire during a one-win campaign which was celebrated in Diliman, but mocked outside of the university’s walls?" "What led to UP hero and legend Paul Desiderio nearly missing out on the chance to wear the school’s name across his chest? How was a once-in-a-generation talent like Juan Gomez De Liaño brought into the fold? Why was it so important for UAAP MVP Bright Akhuetie to leave a legacy at UP that he chose the school over other suitors? These are just some of the questions the book hopes to answer," shared Ganglani. Aside from covering the UAAP, Ganglani has also written features and done on-camera reports on the NBA, PBA, FIBA, Philippine Superliga, and many other leagues. In 2015, he was chosen by Nike to be a representative of Southeast Asia to interview Los Angeles Lakers legend Kobe Bryant in his final NBA season. Ganglani also has his own web sports show – Beyond the Sport w/ Navs – and runs a printing business in Manila with his family. For Ganglani, writing this book on the UP Fighting Maroons’ incredible rise will be the most important project of his career. “As a sports journalist, my ultimate goal to write a story that can inspire others to rise above themselves, which is what the Fighting Maroons did the last five years with help from the dedicated and passionate UP community. Chronicling that special journey, one that was filled with many unforgettable memories, will be the perfect way to do so,” said Ganglani. The book, which will be published by the Nowhere to go but UP Foundation, will include exclusive interviews with UP’s coaching staff and players, as well as key alumni from the UP community who helped augment the state university's athletic programs. According to NTGBU Chairperson and UP Maroons Manager Atty. Agaton Uvero, "the goal really is to produce a tome that will be enjoyed not only by UP alumni and fans of the Fighting Maroons, but also by those who are looking for motivation to strive for something bigger." UP Maroons coach Bo Perasol echoed Uvero's sentiments, stressing that "the story of the Maroons is still being written as we speak." "Nonetheless, UP is in a unique situation as the only state university in the UAAP. As such, its varsity teams face circumstances far different from their counterparts in private schools," said the former Maroon, who graduated from UP Diliman in 1994. "It's a very interesting story, and we hope that it will inspire those who face enormous challenges in the pursuit of their ambitions. Nakakaiyak, nakakatawa, nakaka-inspire. Which is why I and the rest or the team are really excited about this project."